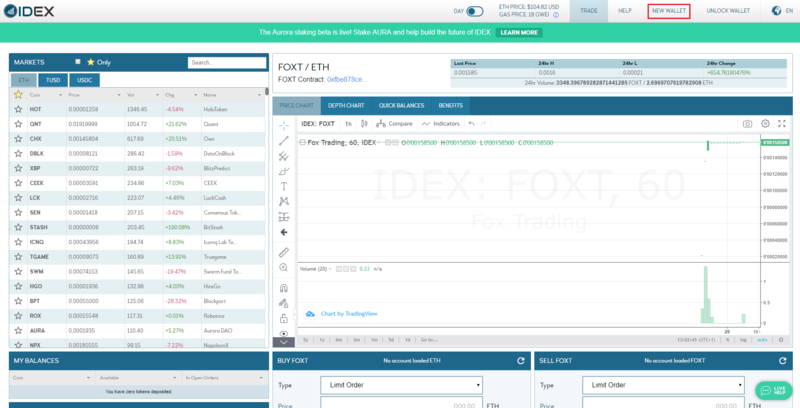 The purpose of this article is to guide anyone interested in buying FOXT tokens on IDEX. The whole process will be explained from the beginning when you have your own FIAT currency (USD, EUR, GBP, etc.) and want to buy FOXT. In case you already own Ethereum go directly to step 3. Each one of these steps will be well clarified and illustrated. If you get lost or have any doubt, do not hesitate to contact us. Easy and quickstep, we have to open an account on a platform such as Coinbase or Uphold. Those platforms are the places where you will be able to exchange your money to cryptocurrencies. To buy FOXT, we are going to need Ethers. One of the most popular platforms is the already mentioned, Coinbase, this will be the one used for our guide, although there are other good options like Uphold, Coinmama, Changelly or Cex . To open an account with any of these platforms, it is very simple, it will only take you a few minutes. 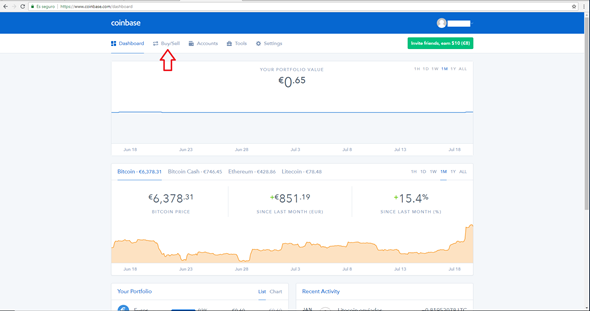 Coinbase, in his main page shown here below, you will see the Buy/Sell button, which allows you to buy the cryptocurrency with your money. Notice that if you already own Ethers you do not need to follow this step, if it is the case, then go directly to the third step. Once you are in, you’ll get the option to buy different Cryptocurrencies, be aware that ETH is the only cryptocurrency that will allow you to buy FOXT on IDEX. 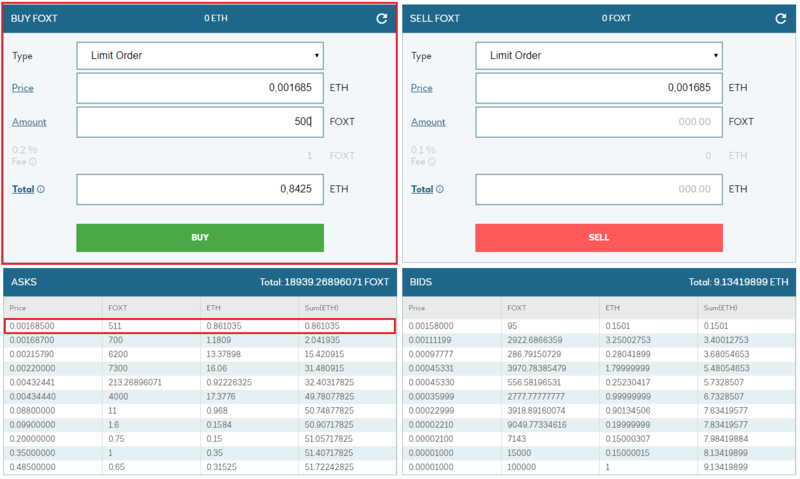 To buy FOXT, right now, there are three exchanges available: Hotbit , Mercatox and IDEX. Hotbit allows you to buy FOXT with Ethereum. Mercatox allows you to buy FOXT with both, Ethereum and Bitcoins. IDEX allows you to buy FOXT with Ethereum. 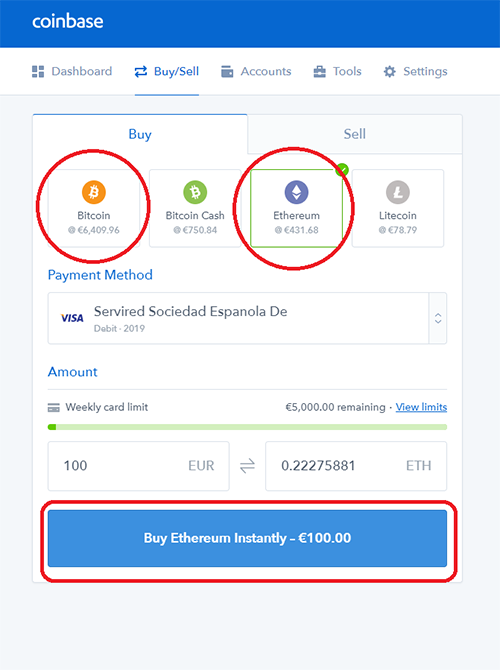 The second step is done, you already own Ethers on Coinbase, now we are going to see how to send them to IDEX, where you can use them to buy FOXT. Since IDEX, is a decentralized exchange it works differently from the usual exchanges, IDEX is powered by Ethereum smarcontracts. IDEX allow you to unlock your wallet directly or create a new one. We are going to guide you in both situations. We are going to start by when you have an ETH wallet and want to unlock it. Click on Unlock Wallet at the upper right side of the dashboard. 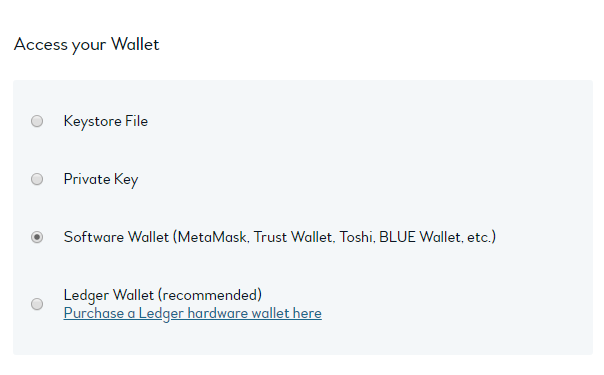 Now you have to choose the wallet that you want to use, Keystore and Private wallets are not recommended because they are less safe than Software or Ledger wallets, so we advise you to use a Software Wallet like Metamask or a Ledger wallet. Then, follow the steps shown on the platform. If you already own a wallet, you will only need to deposit your ETH to IDEX. Get to 3.2 to know how to transfer your ETH to IDEX. If you do not have a wallet, follow these steps to create a new one, to start, click on New wallet, at the upper right side in the dashboard. Now, please read and follow IDEX instructions carefully. Enter a password. Download the Keystore file and save it in a secure place. Once this is done, click on the button below. You have created your ETH wallet for IDEX, remember to save the JSON keystore file and the password in a safe place. Go back to the initial dashboard, click on the profile button, and you will find your new wallet, there are two buttons available, one to copy the wallet address and the other that teaks you to Etherscan. Once you have your new wallet address copied, get back to Coinbase, click on Accounts, you will find your wallets for each cryptocurrency. If you look at the picture below you will see the ETH Wallet. Click send in your ETH Wallet, and a window like the one below will be open. 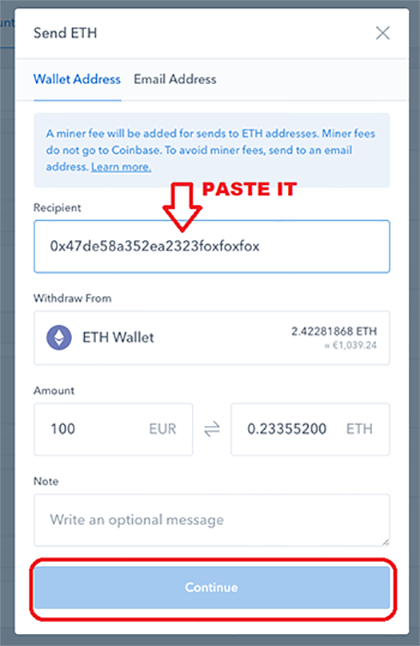 Paste your wallet address, decide the amount that you want to send and press continue. 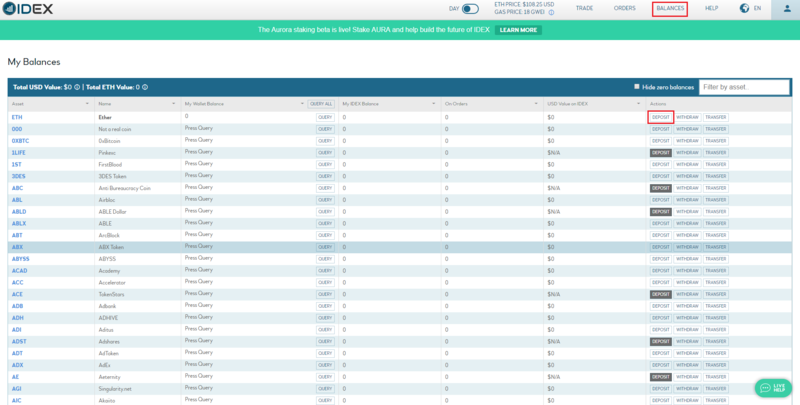 In the upper right menu, click on Balances and you will find Full Balances and Balance History. Full Balances will lead you to the following page where you can deposit ETH to the platform, click on Deposit and follow the steps. Balance History will allow you to see your wallet balance and the balance that you have deposited on IDEX. Search for FOXT Tokens, and you’ll get the option to buy them. At the squares below, there are the BUY and SELL squares, below each, there are ASKS, the selling orders, and BIDS, the buying orders. To get a quantity from someone who is selling, click on the price and it will appear on the buy FOXT square, you'll have to enter the amount. If you want to make a higher order than the amount sold, you’ll have to buy it from the next seller. You will also have the option to set a price and an amount and wait until the order fulfils. That's all! Now you own FOXT tokens that can be used on the platform to purchase your Fox Trading plans.